The machining and fabrication capabilities of RaceKraft & Design does not end with simply building race engines. Our ability to re-create suspension components, to restore, and optimize or even modify racecar chassis, all utilize our machining capabilities and CNC fabrication machinery for the highest quality outcome. As with all vintage racecar projects, it is our ultimate objective to maintain period correct authenticity while offering safety and reliability, without compromising the vintage feel of your race car. Take the opportunity to peruse some of the rare and unique vintage race cars we routinely campaign at the track, that were rebuilt, or are maintained by RaceKraft & Design. Race Car chassis fabrication requires an intimate knowledge of race car engineering, suspension design, and safety requirements. 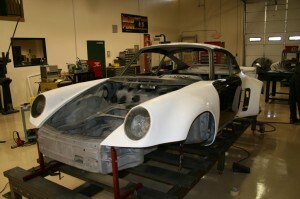 The fabricators at RK&D have built race winning modified production cars, such as the venerable Porsche 911 RSR, and the early Jaguar xk120. All fabrication work is done to the highest standards, typically using 4130 steel, also known as “chromemoly steel”, and TIG welding techniques. Careful attention is paid to annealing, and normalization of the metals, critical to overall strength of the finished product. Only the finest in hardware is employed, using all AN aircraft frame grade fasteners, and high strength rod ends.